This surely isn’t Islam and this is not taught to us by the Prophet sal Allahu aleyhi wasallam. One of the virtuous acts in Islam and the virtues are such tremendous and great in number but see how this is act is being ruined. Once there was one of our brothers who just asked a Deobandi brother how it is to perform Wudu the other way around? (as mentioned in Bahishti Zewar). The Deobandi brother gave an emotional answer that “This is the Wudoo of Shias”. 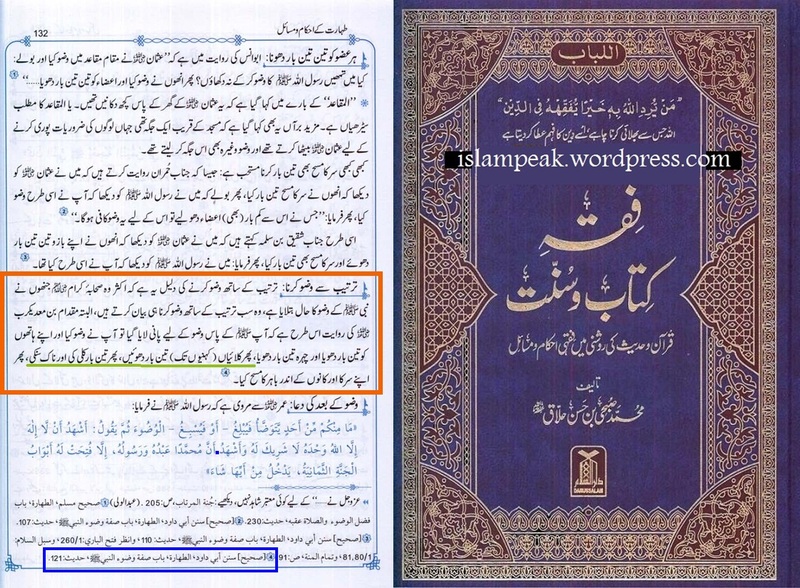 The Deobandi brother didn’t knew that Ashraf Ali Thanvi had the same reverse procedure of Wudoo in his book. Khair, Allaah completed His Deen 1400 years back and One of The Crucial Criterias of Allaah accepting our A’maal is that it has to be accordance to the Sunnah. If its not in accordance to the Sunnah then no matter how sugar coated the act looks like, Allaah does not accept it. This reverse method is no where in the deen of Allaah and this is an innovation in the deen of Allaah. Objection: How a Reverse Wudu is Valid?? Clarification: Maulana Ashraf Ali Thanwi (رحمة الله عليه) is clearly not encouraging to perform wudu in any way contradictory to the Sunnah. He merely says that if wudu were done in that way, it would be valid. It thus implies that if salaah were to be performed with that wudu, it would be validly discharged and not obligatory to repeat. This is something in which the mujtahid imāms (رحمة الله عليهم) differed, so how can anyone of us today criticize them for what they held? In Short, the book IS NOT encouraging anyone to make Wudu out of order but describing a scenario WHEN it occurs out of order as to the status of the Wudu. Deception: The La-Madhabi says: Once there was one of our brothers who just asked a Deobandi brother how it is to perform Wudu the other way around? (as mentioned in Bahishti Zewar). 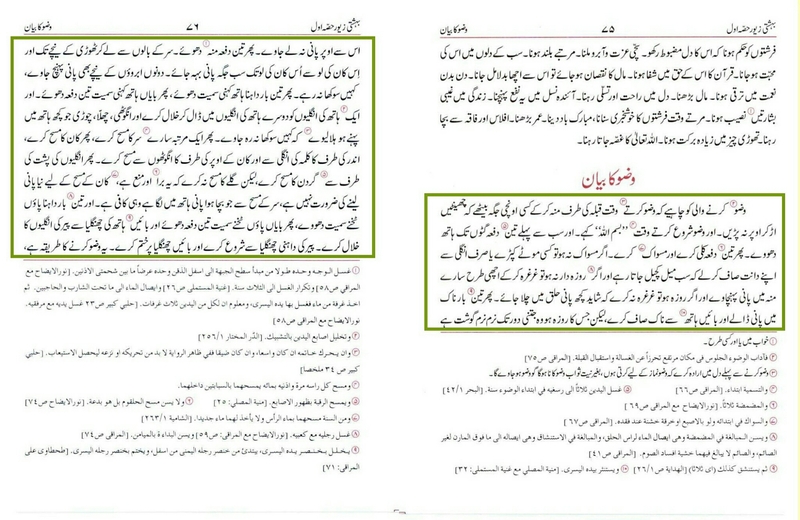 The Deobandi brother gave an emotional answer that “This is the Wudoo of Shias”. This exposes the deceiving arts of the La-Madhabiyyah, they cut the context and present it to the layman, they want the layman to just conclude on whatever they present without giving them a chance to probe the truth. This is indeed the greatest deception, if someone from the deviates approach you with their deceptive intentions, it is important to consult the Ulama and search for the truth instead on coming under their snares of deception. Let whatever the accusations may be. First fraud is that they quote a masa’lah with the omission of starting and ending texts and present only a part of the masa’lah, as you can see in the objection. 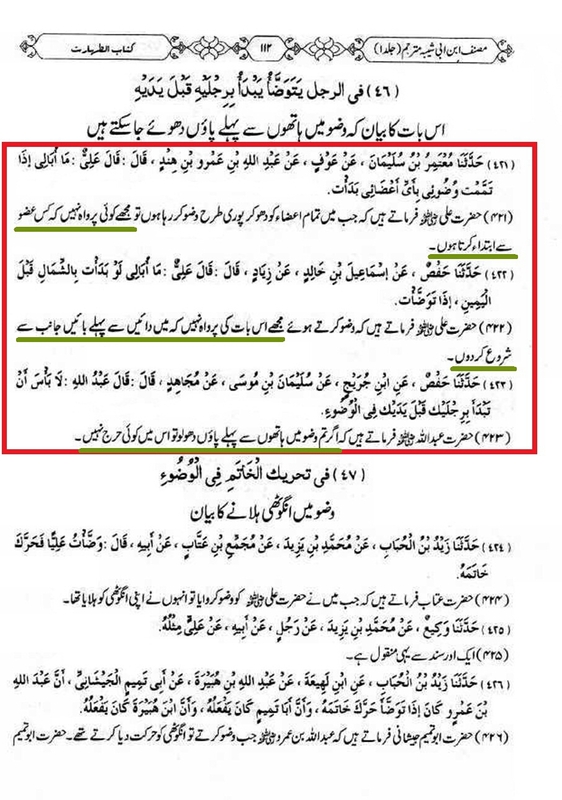 Second fraud is that they overlook the Sunnah way of wudu mentioned in Bahishti Zewar. (1) The person making wudu should face the qiblah and sit on an elevated place so that the water does not splash on him. (2) When commencing wudu, Bism Allah al-Rahman al-Rahim should be recited. (3) First of all, the hands should be washed up to the wrists three times. (4) Thereafter, rinse the mouth three times and use a miswak. If there is no miswak, a thick cloth or even the fore-finger could be used so that all the dirt is removed. If the person is not fasting, he should gargle the mouth thoroughly. However, if he is fasting, he should not gargle thoroughly because there is a possibility that water will go down the throat. (5) Thereafter, rinse the nose three times and clean it with the left hand. However, the fasting person should not allow the water to go beyond the soft-bone of the nose. (6) Then wash the face three times: from the hair-line till below the chin, and from one earlobe to the other. Water must reach all these places and no place should remain dry. (7) Wash the right hand up to and including the elbows. Thereafter wash the left hand up to and including the elbows. And make khilal of the fingers by passing the fingers of one hand through the fingers of the other hand. If there is a ring or any bangles etc on the fingers, it should be re-adjusted so that no part is left dry. (8) Thereafter make masah of the head (passing wet hands over the head). Then make masah of the ears by inserting the forefingers into the ears and making masah of the back of the ear-lobes with the thumb of each hand. Thereafter, make masah of the neck with the back of the fingers of both hands, but masah of the fore-neck i.e. throat should not be made as this is prohibited. (9) Thereafter wash the right foot up to and including the ankles. Do the same for the left foot. Make khilal of the toes of the feet with the little finger of the left hand. When making khilal, commence with the little toe of the right foot and end with the little toe of the left foot. This is the correct method of performing wudu. 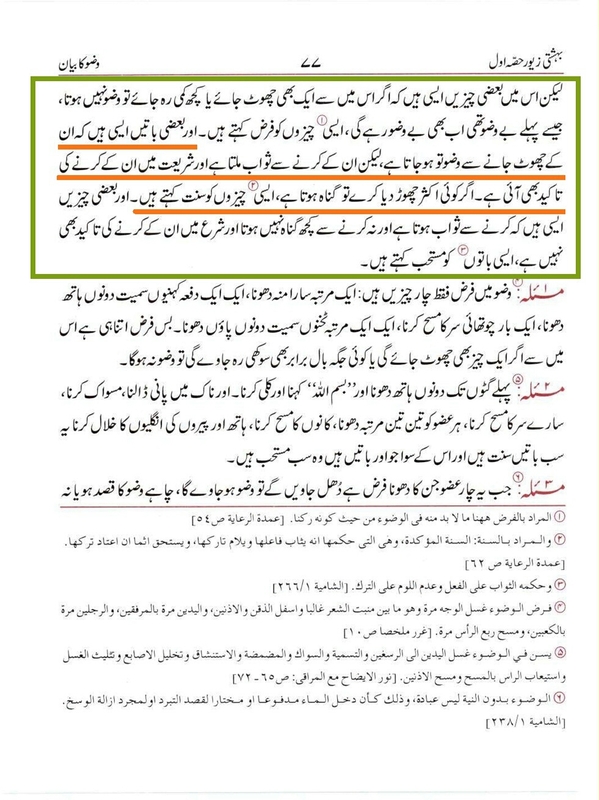 Maulana Ashraf Ali Thanwi (may Allah have mercy on him) says that wudu should be according to Sunnah in perfect order, but if someone makes wudu in other way, it will be against Sunnah and he may be sinful. 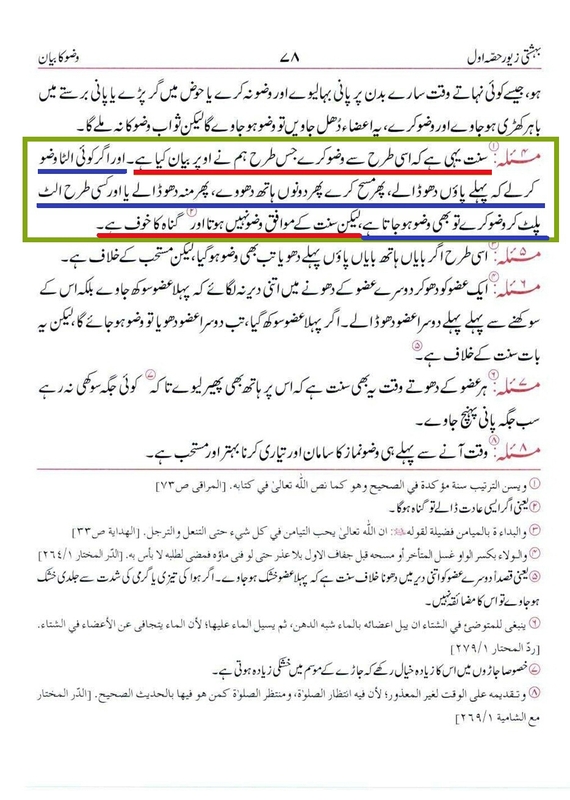 The Sunnah way of wudu is prevalent among all Hanafis, the sect of Ahl-e-Hadith presents the text from this book in a fraudulent way and invites the Hanafis to do wudu against the Sunnah way. This is in fact a clear proof of their enmity towards Sunnah. Sunnah is called an act narrated from the Messenger of Allah (may Allah bless him and grant him peace) and many of the Companions have narrated his wudu in the same order. However, sometimes he did otherwise to just to show that it is also lawful. This is the reason that Miqdam bin Ma’dikarib (may Allah be pleased with him) reported in a Hadith that the Messenger of Allah (may Allah bless him and grant him peace) performed wudu in a different order. This Hadith is Sahih li Ghairih and its sanad is Hasan, this was narrated by several persons from Abdur Rahmān bin Maysarah and he was declared thiqah (reliable) by Shaikh Ijli. Abu Dawud said: All the shuyukh of Harir are thiqah and Ibn Hibban mentioned him among reliable ones, and the other narrators are also thiqah. 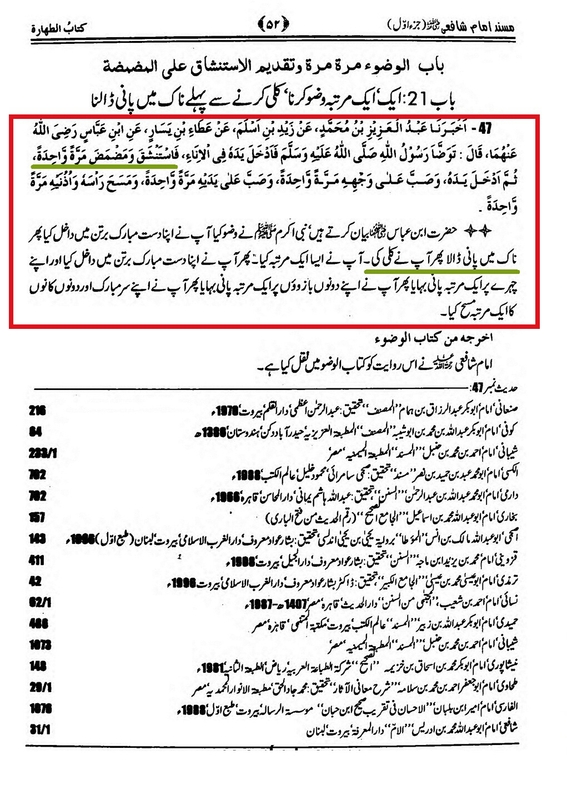 Another version of Sunan Abu Dawud, published with the notes of Ghair Muqallid scholar Zubair Ali Zai, also says in the footnote: Sanad Hasan. 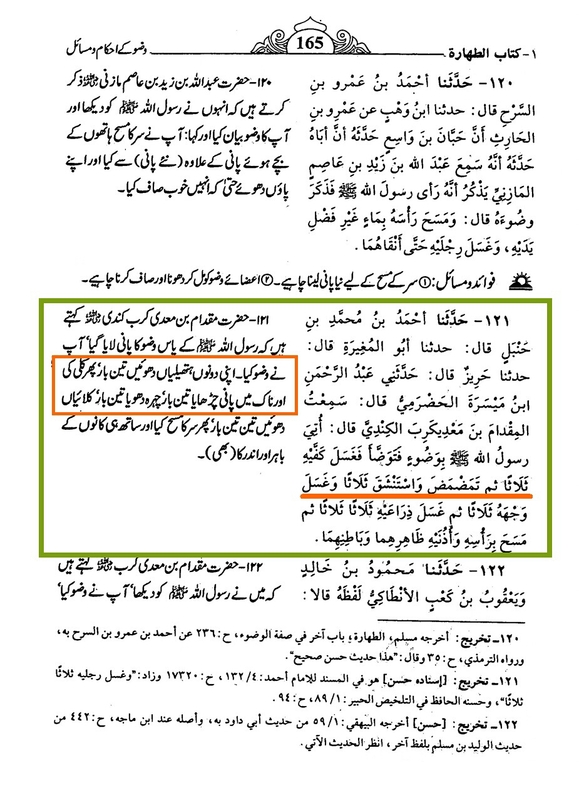 It is widespread trend among the Ahl-e-Hadith people that if their opponents misquote an Ayat or Hadith mistakenly, they bluntly call it Tahrif (distortion), not mistake. 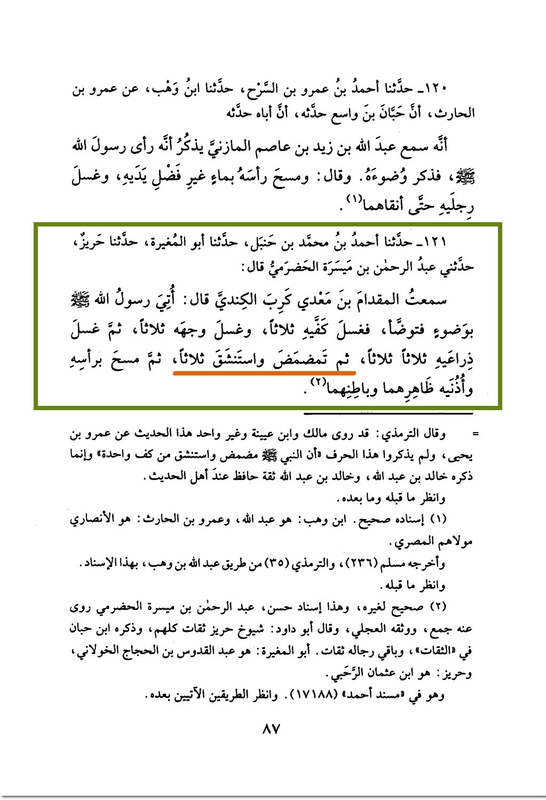 In the version of Abu Dawud published with the notes of Zubair Ali Zai, the Arabic text of the Hadith and its translation has been misplaced; the text of rinsing mouth and nose (ثم مضمض واستنشق) was placed after the text of washings the wrists apparently to make the order correct. حَدَّثَنَا مُعْتَمِرُ بْنُ سُلَيْمَانَ، عَنْ عَوْفٍ، عَن ْعَبْدِ اللَّهِ بْنِ عَمْرِو بْنِ هِنْدٍ، قَالَ : قَال َعَلِيٌّ:” مَا أُبَالِي إِذَا أَتْمَمْتُ وُضُوئِي بِأَيِّ أَعْضَائِي بَدَأْتُ “. حَدَّثَنَا حَفْصٌ، عَنْ إِسْمَاعِيلَ بْنِ أَبِي خَالِدٍ، عَن ْزِيَادٍ، قَالَ : قَالَ عَلِيٌّ:” مَا أُبَالِي لَوْ بَدَأْتُ بِالشِّمَالِ قَبْلَ الْيَمِينِ إِذَا تَوَضَّأْتُ “. حَدَّثَنَا حَفْصٌ، عَنِ ابْنِ جُرَيْجٍ، عَن ْسُلَيْمَانَ بْنِ مُوسَى، عَن ْمُجَاهِدٍ، قَالَ : قَالَ عَبْدُ اللَّهِ:” لَا بَأْسَ أَنْ تَبْدَأَ بِرِجْلَيْكَ قَبْلَ يَدَيْكَ فِي الْوُضُوءِ “. 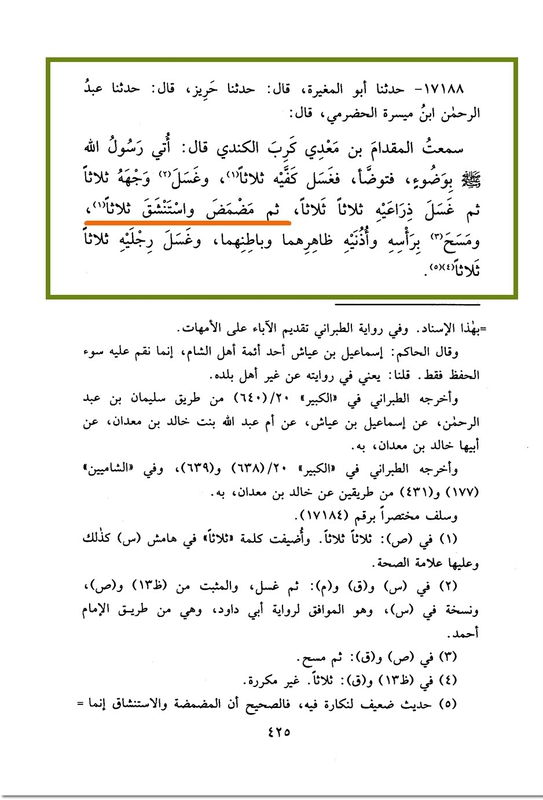 It is nowhere mentioned in a Hadith or in an Athar that doing wudu in non-Sunnah order makes it invalid. Imam Tirmidhi (may Allah have mercy on him) says: the scholars have difference of opinion regarding one who leaves rinsing mouth and nose, so some say if one leaves them in wudu and then performed Salah, he will have to re-offer Salah and the ruling is same for both wudu and (ghusl of) Janabah (impurity). This is the opinion of Ibn Abi Layla, Abdullah bin al-Mubarak, Ahmad and Ishaq. Imam Ahmad says that rinsing nose is more required than rinsing mouth. 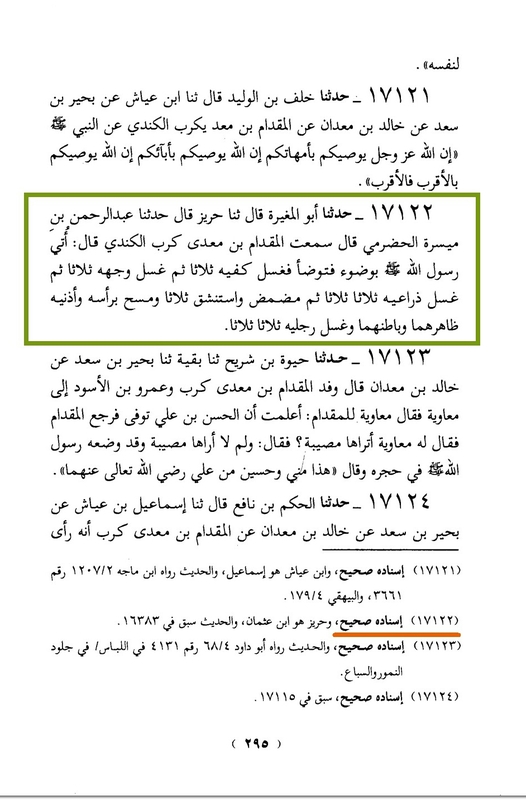 Imam Tirmidhi says that a group of scholars says: he will have to reoffer in case of Janabah, but not in wudu, and this is the opinion of Sufyan al-Thauri and some scholars of Kufa. While, another group of scholars says that he neither has to reoffer wudu nor ghusl of Janabah as these acts are Sunnah and there is no need to re-offer Sunnah if it is left. This is the opinion of Imam Malik, and the last opinion of Imam Shafi’i (may Allah have mercy on them). قال أبو عيسى : حَدِيثُ سَلَمَةَ بْنِ قَيْسٍ حَسَنٌ صَحِيحٌ ، وَاخْتَلَفَ أَهْلُ الْعِلْمِ فِيمَنْ تَرَكَ الْمَضْمَضَةَ وَالِاسْتِنْشَاقَ ، فَقَالَتْ طَائِفَةٌ مِنْهُمْ : إِذَا تَرَكَهُمَا فِي الْوُضُوءِ حَتَّى صَلَّى ، أَعَادَ الصَّلَاةَ وَرَأَوْا ذَلِكَ فِي الْوُضُوءِ وَالْجَنَابَةِ سَوَاءً وَبِهِ . يَقُولُ ابْنُ أَبِي لَيْلَى , وَعَبْدُ اللَّهِ بْنُ الْمُبَارَكِ , وَأَحْمَدُ , وَإِسْحَاق , وقَالَ أَحْمَدُ : الِاسْتِنْشَاقُ أَوْكَدُ مِنَ الْمَضْمَضَةِ . قَالَ أَبُو عِيسَى : وَقَالَتْ طَائِفَةٌ مِنْ أَهْلِ الْعِلْمِ : يُعِيدُ فِي الْجَنَابَةِ وَلَا يُعِيدُ فِي الْوُضُوءِ , وَهُوَ قَوْلُ سُفْيَانَ الثَّوْرِيِّ وَبَعْضِ أَهْلِ الْكُوفَةِ ، وَقَالَتْ طَائِفَةٌ : لَا يُعِيدُ فِي الْوُضُوءِ وَلَا فِي الْجَنَابَةِ لِأَنَّهُمَا سُنَّةٌ مِنَ النَّبِيِّ صَلَّى اللَّهُ عَلَيْهِ وَسَلَّمَ ، فَلَا تَجِبُ الْإِعَادَةُ عَلَى مَنْ تَرَكَهُمَا فِي الْوُضُوءِ وَلَا فِي الْجَنَابَةِ , وَهُوَ قَوْلُ مَالِكٍ , وَالشَّافِعِيِّ فِي آخِرَةٍ . According to Imam Ahmad bin Hanbal (may Allah have mercy on him), it is Wajib to rinse mouth as well as nose in both wudu and ghusl, while according to Imam Abu Hanifah (may Allah have mercy on him) it is Wajib in ghusl and Sunnah in wudu. Imam Malik and Imam Shafi’i (may Allah have mercy on them) it is Sunnah in wudu as well as ghusl. 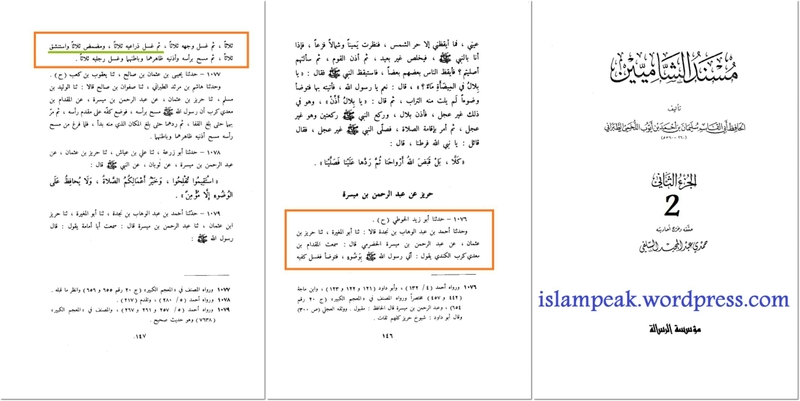 The Hadith books contain both types of the narrations; wudu with order and wudu without order, but Maulana Ashraf Ali Thanwi (may Allah have mercy on him) has made it clear that the Sunnah way of wudu is to perform it in correct order, but if one makes wudu against the order, then also the wudu will be valid and the Salah will be alright, but one will be deprived of the reward of acting upon Sunnah. However, if one makes it a habit to do wudu in reverse order, then it is sinful. May Allah grant us correct understanding the religion, Aameen! Translated by: M Khalili Qasmi.